There are so many things to do in Plett, that Carrie Hampton found it hard to choose. Read her exploits in this short article packed with action A weekend away in Plettenberg Bay can be exhausting because there are so many things to do. Where to start on the list of adventurous activities was a difficult decision so I let the weather determine the order.The ocean was running quite a swell so sea-kayaking and boat-based whale watching would have to wait a day, and there was a chill breeze so I decided against the black river tubing in a tractor tyre inner tube.I chose instead a scenic flight to orientate myself followed by some high adrenaline Bungy jumping then a bit of communing with our cousins at Monkeyland, ending in dinner at the divinely tranquil Hog Hollow Country Lodge.The 4-seater Piper aeroplane was the smallest aircraft I had ever squeezed into and it flew like a drunken wasp at the whim of the gusty wind. The wings situated above the windows gave an uninterrupted view of the world making me feel a little vulnerable but as soon as I saw whales my fears instantly vanished.From above the Robberg Peninsular resembled a giant reptile and the folds of thickly wooded hills inland revealed an impenetrable landscape I had not realised existed.This ride was gentle compared to what was coming at the Bloukrans River Bridge. 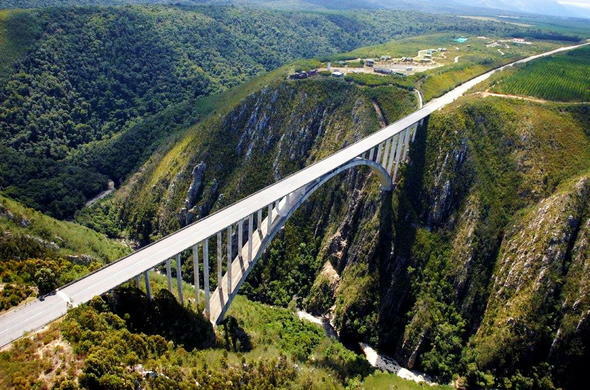 Here is the highest bungy jump in the world at 216 metres, which I must admit I had no intention of doing. My companion showed no fear and leapt off the bridge like a swallow in flight. While watching him jump I felt a sense of his thrill and that was good enough for me.I wanted to get back to nature and Monkeyland provided the perfect setting to sit and watch other primates take to the air without the use of an elastic cord attached to their ankles. Evolution may have given us much but it did not leave us with the natural acrobatic grace of a leaping lemur.Sensing a change in the weather, Dave Rissik of Ocean Adventures promised that if I got up before 7am the next day, he would take to the ocean and show me five species of marine mammals by lunchtime and he did. Humpback, Bryde's and Southern Right Whales, leaping Common Dolphins and curious Cape Fur Seals.I was having a wonderful watery kind of day and decided upon some afternoon exercise in one of Real Cape Adventures sea kayaks. We paddled gently up the Keurbooms river and returned to the shallow lagoon where we floated right up to the sundowner deck of the Keurbooms River Lodge for a sunset tipple which finished me and the weekend off perfectly.The author of this article is Carrie Hampton - she can be contacted on email: carrieh@iafrica.comCopyright © 2002 Carrie Hampton. All rights reserved. Reproduction in whole or in part without the permission of the author is prohibited. See wonderful marine creatures such as Humpback, Bryde's and Southern Right Whales, Common Dolphins and Cape Fur Seals. Plettenberg Bay provides ultimate relaxation - at Monkeyland the dog and the monkey chill out together.